Mao era China was a remote, mysterious, drab place of ration cards, uniforms, Big Brother watchfulness’sort of what North Korea is like today. Lang Ping, a former Chinese volleyball player, told the Washington Post, “There was nothing to be happy about or not” in Mao’s China. “Life was simple and all persons were made to be the same.” She said she slept on a wooden plank and had just three sets of clothes. Couples were separated for long periods of time and gradually became emotionally detached, many irreconcilably so. A female concert pianist born to U.S.-educated parents and trained at China’s finest conservatory, married an illiterate member of the People’s Liberation Army march band because she thought his peasant upbringing could compensate for her counter-revolutionary background. Many Shanghaiers and other residents of coastal cities were relocated to remote interior cities in the early 1960s. This was part of Mao Zedong's "third front" policy of establishing safely remote bases in China's interior for strategic industries under what was perceived to be the threat of Soviet invasion. These displaced urban communities contained many members who retained a strong sense of their previous urban identities while living in this sort of internal industrial "exile". Books: Fanshen by William Hinton is the classic account of rural revolution during the communist-led civil war in the late 1940s. China Witness, Voices from a Silent Generation by Xinran (Pantheon Books, 2009) is collection of oral histories from Chinese who survived the Mao period. Lonng March books include The Long March by Edmund Jocelyn and Andree McEwen (2006) and The Long March by Sun Shuyun, based in accounts from 40 of 500 participants that were still alive in 2005. Mao; the Untold Story by Jung Chang and Jon Halliday (Knopf. 2005). Jung Chang, author of Wild Swans, and her husband John Halliday, a British historian, portrays Mao as villain on the level of Hitler and Stalin. The book was read by U.S. President George Bush and embraced by the American right as a condemnation of Communism. It characterizes Mao as cruel, materialistic, self-centered and a leader who used terror with the aim of ruling the world. There is also a Mao biography by Jonathon Spence. Also check out: Mao's New World: Political Culture in the Early People's Republic by Chang-tai Hung (Cornell University Press, 2011) and The Private Life of Chairman Mao by Dr. Li Zhisui (1994). Other books: The Penguin History of Modern China by Jonathan Fenby 3) . Red Star Over China by Edgar Snow; 4) China: A New History by John K. Fairbank; 5) In Search of Modern China by Jonathan D. Spence; 6) Cambridge History of China multiple volumes (Cambridge University Press). You can help this site a little by ordering your Amazon books through this link: Amazon.com. In many houses there was no refrigeration, no air conditioning. Children gathered around industrial refrigerators kept by the local bus company, begging, “Comrade, give us some ice!” In the years before the Cultural Revolution some families killed their family pig and ate it in the early spring and then did nothing but lie in bed for weeks at a time, subsisting on congee, waiting for the wheat harvest. The first televisions didn’t show up in people’s homes until the 1970s and then only the elite got them. Ni Ching Ching wrote in the Los Angeles Times, “Television was such as new phenomena that and the state broadcasts lasted only a few hours at night and half of it was propaganda. Still we treated the magic box like a shrine. By day it was covered with an embroidered cloth and by night we opened our small living room to neighbors who brought stools and sat three or four rows deep.” Through the 1980s there were only a few hotels and taxis in Beijing, The streets were dark and deserted at 8:30pm, The few cars on the road drove with their lights out. They did this people said because the drivers didn’t want to burn out their bulbs. The Communists created a drab world of ration cards, uniforms, Big Brother watchfulness with suspicion directed at anyone who tried to improve himself. Under Maoist forced egalitarianism everybody was poor except the political elite and people were supposed to find fulfillment in spiritual matters and comradeship not material things. 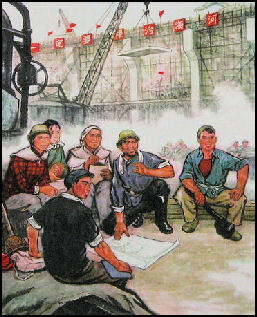 In the Mao era, he economy emphasized heavy industry. Success was measured in how many tons of steel produced and barrels of oil pumped from the ground and how well targets and quotas set in five-year plans were met. The first Five Year Plan was in 1953. Over 100 new industries were started, with a strong emphases on heavy industries and the production of things like steel, tractors, mining equipment and generators. China’s 11th Five Year Plan was approved in October 2005 and began t take effect in 2006. School and health care were basic but free. Housing was heavily subsidized. No one had a car. People huddles in quilted coats in the winter, waiting in long lines for buses. A bicycle was beyond the means of most people. To get one required half a year’s salaries and six months worth or ration coupons. There was little bargaining and no tipping. There were few shops, restaurants, vendors and markets. The only clothes that were available were dark blue and grey Mao suits. People needed ration coupons tp buy meat, rice milk powder and cooking oil and waiting for hours in lines to get their monthly allotments. In the 1960s, a family living in a modest apartment in Shanghai are meat about once a week. In the 1970s, sugar and cooking oil were rationed. Food coupons could only be used in local markets to buy rice and vegetables. Friendship stores were the only places foreign goods could be bought. They were famous for their sullen, slow service and accepted only foreign exchange certificates. One Chinese factory worker told the Washington Post, "In old China, before reforms, we all had this secure life. Nobody made any money but nobody felt any stress, unless you did political things. Now from morning till night, I have this sense of an impending crisis." See Savings. Job Searching Customs. 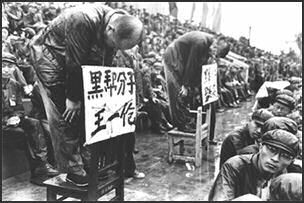 in the Cultural Revolution Repeating a pattern established by the Chinese emperors that preceded him, Mao withdrew China from the international marketplace. He created a state economy which controlled and owned everything from flower shops, to pig farms to steel mills. Factories were generally given certain amounts of raw materials and told how products they were supposed to produce. Private businesses were illegal and entrepreneurs were regarded as criminals. State-owned enterprises grew into big bloated giants that employed lots of people but gobbled up much more money than they produced. But no matter how inefficient they were they were not allowed to fail. They continued sucking up more and more resources. Edward Chancellor wrote in the Wall Street Journal: “In 1974, the future Chinese premier Deng Xiaoping led a large delegation to the United Nations in New York. Chinese officials discovered, as they prepared for the expensive trip, that the could muster only $38,000 in foreign cash. In those days there were no banks in China except the People's Bank of China, then a department of the Ministry of Finance.